K-Zone is Australia's number one magazine for kids aged 6-13.It's jam-packed with fun including movie news, gaming goss, comics and stacks of puzzles, quizzes, activities and posters. Every issue is themed around something special, be it superheroes, videogames or even K-Zoner favourites like pranks and jokes.It's great value and a perfect way to get kids reading. 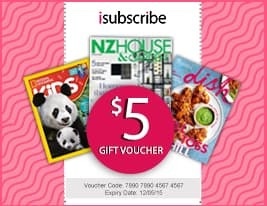 Don't miss out, subscribe now!NOTE: SUBSCRIPTION COPIES DO NOT COME WITH K-ZONE FREE GIFTS AVAILABLE ON NEWSSTAND COPIES. Be the first person to tell us what you think about K-Zone (AU) and you'll save $5 on your next purchase!